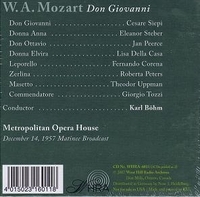 "Karl Böhm has made at least a half dozen recordings of this great work. All are good; most are very good. But until this recording came along none was regarded as one of the 'great recordings of the 20th Century'. I like the sleek, undistorted sound, wideranging in dynamics as well as frequency response. The artistic merits are likewise remarkable. The orchestra begins with no special sheen, for about the first 30 seconds. Then, quite suddenly, it catches fire, and the whole game changes. By the time Leporello comes along, things have come together, a tension and an aura of expectation built, a level that persists until DON GIOVANNI is safely no longer around to bother any future Donna Anna and Elvira. The Met Orchestra plays as if possessed, its sound sleek and sure. It's not like the VPO, but is just as beautiful in its own way, not surpassed by the VPO in any of the recordings it has made, under Böhm, Krips, or anyone else. It is remarkable, the impossible dream. It is mono, of course, but so perfectly balanced and undistorted that it makes no great difference. "Many a soprano has tackled Anna and come to regret the attempt, but Steber conquers the several contradictory requirements of the role in superb fashion. Her technical control is admirable: every high A is struck with precision and, unlike those of many who have that note, the descending sixteenths which follow are equally clean. Beyond vocal fortitude, an Anna must have an easy command of fioriture. This broadcast portrayal may represent the apex of Steber's Metropolitan career." "The singers [in the above] leave little to be desired. Steber is an imperious and accurate Donna Anna with the technique needed in 'Non mi dir' and fully confirms her status as one of the great Mozart singers of the time. The surprise of the performance is Jan Peerce as Don Ottavio, singing with good vocal quality and the technique required by the runs in 'Il mio tesoro'." 'Basically', Robert Merrill said, 'Jan was a lyric tenor with a heavier voice than most lyrics'. Mr. Merrill, the baritone who sang many times with Mr. Peerce, said that the tenor kept his voice to the very end because he never forced. 'He never went out of his repertory', Mr. Merrill said. 'The Met offered him many roles that he refused to accept because he thought they were too heavy for him. Jan stuck to what he knew he could do. He produced a beautiful sound and had a perfect legato. He also had high notes, and who can forget the C he used to take at the end of the first act of BOHEME? Everybody at the Met loved Jan. He had temperament, sure, but never a bothersome ego'. James Levine, who first heard Mr. Peerce in Cincinnati many years ago and later worked with him professionally, described Mr. Peerce as 'one of the most extraordinary singers and human beings I have ever known'. He paid tribute to the tenor's 'stylistic versatility, rhythmic Ã©lan, communicative ability and wide repertory'. "Lisa Della Casa, the Swiss soprano who combined an outstanding voice, stunning beauty and exceptional stage presence to become one of the foremost interpreters of Richard Strauss, was one of a generation of sopranos to emerge from war-shattered Europe in the 1940s. In her Strauss roles, like the title character of Arabella, which alternately calls for demure graciousness and soaring enthusiasm, Ms. Della Casa displayed 'a wholly appealing kind of fragility, tender and unmannered', the musicologist J. B. Steane wrote in his book THE GRAND TRADITION: 70 Years of Singing on Record. She was equally extolled for her roles in Mozart operas. In Europe, where Ms. Della Casa performed at the major opera houses, her beauty and charisma could seduce even a great conductor like Herbert von Karajan into pursuing her for roles that were out of her vocal range. 'Karajan saw me as the Marschallin and, if you can believe it, immediately asked me to sing TANNHÃ„USER with him', even though the role, Venus, called for a dramatic soprano or a mezzo with an upper register and thus was not at all appropriate for her voice, she said in an interview in Lanfranco Rasponi's book THE LAST PRIMA DONNAS. 'He told me I had just the right kind of sexiness to make a splendid goddess of love'. She turned down the role. Her complaint was the opposite at the Metropolitan Opera, where, she said, the general manager Rudolf Bing typecast her. She sang four roles at the Met: Countess Almaviva, Donna Elvira, the Marschallin and Arabella - a total of 114 times in her 147 performances. 'My 15 seasons at the Metropolitan were not happy ones', Ms. Della Casa told Mr. Rasponi. 'Mr. Bing would not have it any other way, for he kept repeating that I was indispensable for the Mozart and Strauss operas, and that he had a surplus of sopranos for the Italian and French ones'. Yet Ms. Della Casa rarely bickered or engaged in offstage dramatics. In an opera world notorious for outsize egos and histrionic rivalries, her colleagues openly admired her. The Romanian soprano Maria Cebotari, famous for her portrayal of Arabella in the 1940s, lobbied for the young Ms. Della Casa to sing alongside her in the role of Zdenka. 'I'll put my hand in the fire for her', Ms. Cebotari told a Vienna opera manager who was skeptical of this relatively unknown soprano's talent. Ms. Della Casa appeared first at the Salzburg Festival in 1947 as Zdenka in ARABELLA; after hearing her premiere performance, Richard Strauss himself asserted, 'The little Della Casa will one day be Arabella!' In the fall of 1947 she made her debut as Gilda in Verdi's RIGOLETTO at the Vienna State Opera, where she remained an ensemble member for 27 years. In 1953 Ms. Della Casa made her debut as the Countess Almaviva at the Metropolitan Opera, where she continued to perform until 1968. Her early Met performances as Donna Elvira and Madama Butterfly did not impress the New York critics. But she hit her stride with Arabella. 'There was a youth in her movement and a beauty in her appearance that might well have driven Vienna's gay blades wild', Howard Taubman of THE NEW YORK TIMES wrote in 1957. 'And her singing was unfailingly lovely - accurate, well focused and sensitively phrased'. 'The strange thing about a singer's destiny', she told Mr. Rasponi, 'is that you have to renounce everything for its sake, and then it's all over in a flash'." "Roberta Peters, who would sing with the Met 515 times over 35 vigorous years, was internationally renowned for her high, silvery voice; her clarion diction in a flurry of languages; [and] her attractive stage presence. In addition to the Met, with which she appeared regularly from 1950 to 1985 - one of the longest associations of any singer with a major opera company - Ms. Peters was heard at the Lyric Opera of Chicago, Cincinnati Opera, the Vienna State Opera, Covent Garden and elsewhere. Known for taking meticulous care of her voice, she continued to sing in recital until well into her 70s, a good two decades past the de facto retirement age in her line of work. On 23 Jan., 1950, the 19-year-old Ms. Peters stood on the stage of the old Metropolitan Opera House on Broadway and 39th Street in Manhattan. There, in the darkened hall, she sang 'Der HÃ¶lle Rache' from THE MAGIC FLUTE, which, with its fiendish series of high Fs, is among the canonical texts of the coloratura repertory. Somewhere out in the darkness was Mr. Bing. 'It was the first audition I had done for anyone, and I was so scared', Ms. Peters told THE CHICAGO TRIBUNE in 1993. 'When it was over he asked if I would sing it again. Then he asked me to do it again. Well, I sang it four times, not knowing that he had silently brought in conductors Fritz Reiner, Fausto Cleva and Fritz Stiedry to hear me'. Peters made her impromptu Met debut 17 Nov., 1951, substituting for Nadine Conner. 'The delightful surprise of last night's performance of DON GIOVANNI at the Metropolitan was the emergency debut of little Roberta Peters in the part of Zerlina', THE NEW YORK WORLD-TELEGRAM's review the next day said. 'The voice came through the big house as clear as a bell, the notes equally bright and focused and the phrasing that of a true musician'. Ms. Peters was by all accounts one of opera's least diva-like divas."